Saturday, August 24, 1912: We’ve been expecting company for the last several days, but it seems to be as if they aren’t coming. It seems to be the luck around here. Did they make food in anticipation of the company that didn’t show? Since apples are in season, maybe they made an apple dessert.. 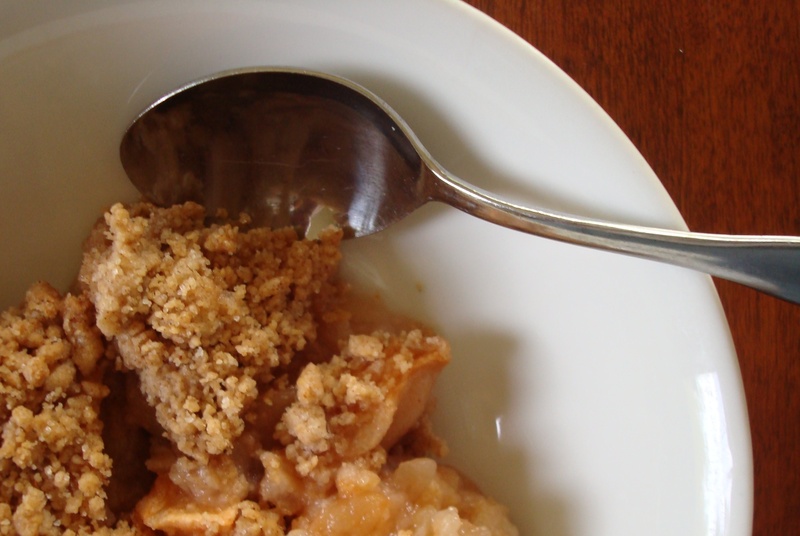 I tried two Apple Crisp recipes to see which was the best. First I made the recipe that was in an old Pennsylvania Grange Cookbook; then I made the recipe on the Betty Crocker website. Preheat oven to 350 degrees. Stir together flour, sugar (1/2 cup), salt, and baking powder; add melted butter and egg. Stir together until crumbly. Pare and slice apples, and place in an 8” X 8” baking dish. Cover with the flour mixture. Bake approximately 45 minutes or until the apples are soft. Heat oven to 375º F. Grease bottom and sides of 8-inch square pan with shortening. Spread apples in pan. In medium bowl, stir remaining ingredients except cream until well mixed; sprinkle over apples. Bake about 30 minutes or until topping is golden brown and apples are tender when pierced with a fork. Serve warm with cream. The verdict—Both recipes were good and I’d recommend either recipe. The oatmeal in the Betty Crocker recipe made that Apple Crisp crunchier than the other one. And, the flavors were a little more subdued with the Old Pennsylvania recipe because white sugar (rather than brown sugar) and fewer spices were used. Posted on August 24, 2012 August 30, 2015 by SherylPosted in FoodTagged apple, desserts. I think that the Pennsylvania recipe is the closest to the one in my Grandma’s cook book, and what I grew up with. Probably because of the Amish influence in our families recipes. I also think that the Pennsylvania recipe is the closest to the recipe that my mother made–though I think that she may have used f mixture of brown and white sugar. I have not met an apple crisp I did not like! I have the Betty Crocker recipe and I know that is good. They haven’t changed it much since their 1952 cookbook. Thanks for sharing. The Betty Crocker one is also the one that I usually use. I use the recipe in the 1973 cookbook–which is almost exactly the same as the one that is online. mmm– ice cream sounds good. Well that’s fun to bake both and compare, look out Rachel Ray. I have a old Betty Crocker Cook book and use it alllll the time. Even though I prefer cook books with pictures, you just know it’s going to turn out every time. Plus I love oatmeal in baking. Yum. I got a Betty Crocker cookbook at my bridal shower years ago–and it still is the first the cook book that I always turn to. I thought was interesting that oats were not used in the PA grange cookbook. Both do look delicious…can’t wait to try them, I love apples, raw, cooked or baked and the smells that fills the house can put any Yankee Candle to shame!! 🙂 Blessings! I would like some apple crisp, from either recipe, right now! I think that you will like the flavor that nutmeg adds. 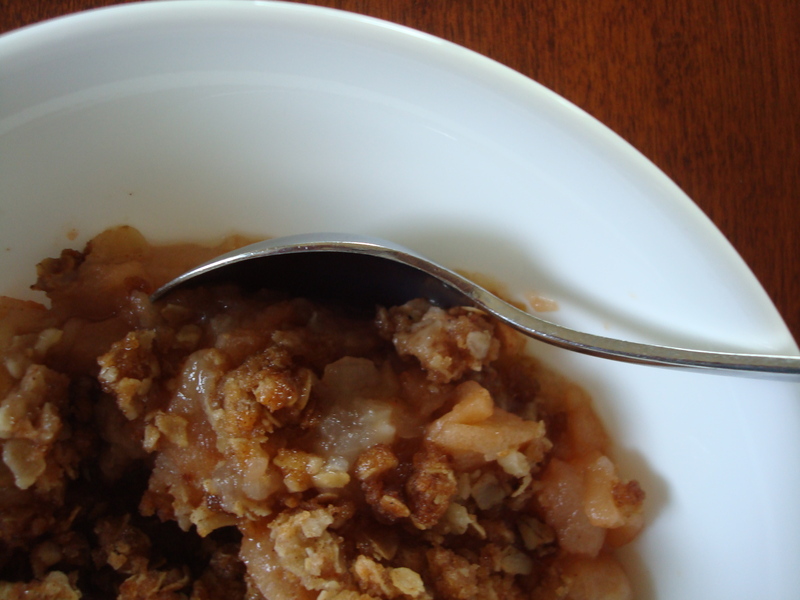 Nutmeg adds a subtle woodsy warmth to apple crisp.